This table is designed so you can eat a meal or read a book while sitting in your chair or sitting in your bed. The full table top provides a generous 16" x 30" flat surface to hold several plates and glasses or even a large serving tray. 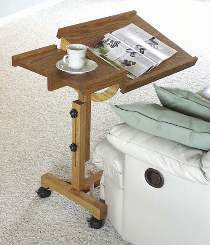 The split top lets you tilt a portion of the table top for reading a book or newspaper while still providing a flat portion so you can enjoy a beverage or snack as you read. Table can be adjusted in height from approx. 25" to 34" high. Locking casters prevent the table from rolling away while you are using it. Patterns drawn FULL SIZE. Order hardware parts package separately or see Special Offer.Adjustable Roller Table Hardware Parts Package Includes three 2 inch locking casters, three adjustment knobs, double-acting hinges and miscellaneous hardware. Project plan, wood and wood finish are not included.